Would you want Windows Phone 8 in a luxury casing? 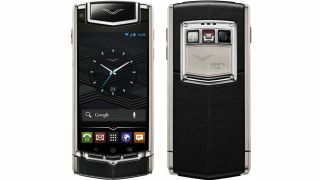 Ultra-luxe Android handset Vertu Ti nearly had a Windows Phone 8 counterpart - but the plan was scrapped when the Microsoft OS proved too complex. Vertu's Head of Concept and Design, Hutch Hutchinson, told ZDNet that Windows Phone 8 was simply too difficult to work with, meaning a Windows mobile for the one per cent has been ruled out for now. A Windows Vertu would have been in competition with efforts from Vertu's former parent company Nokia, like the Lumia 920 - although admittedly Vertu handsets typically cost around $10,000, which is quite a bit more than the 920. And a lot more than the Lumia 620. Despite its sky-high price, the Vertu Ti runs creaking old Android Ice Cream Sandwich instead of the most recent build, Jelly Bean. Its other specs are a bit middling as well, with a 1.7GHz dual-core processor, 8-megapixel camera, and NFC. Vertu was started in 1999 as a luxury offshoot of Nokia, but was sold to private equity group EQT VI last year. It continues to do well, according to Hutchinson, despite producing ridiculously priced mobiles that are nowhere near as well-specced as more affordable rivals. Around 300,000 people now own its luxury mobiles, and there's a healthy market in fakes besides.